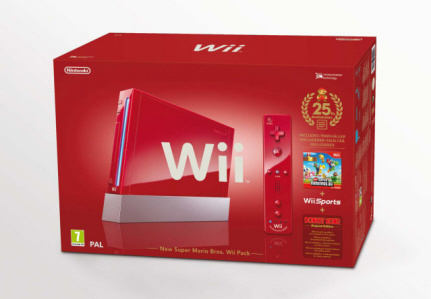 Fresh from the news that Europeans will receive Super Mario All-Stars for Wii, it looks like those lucky gamers will also receive the red Wii recently announced for Japan. 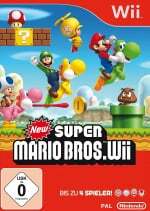 As well as containing a red Wii with matching Remote Plus and Nunchuk, Nintendo is throwing in a copy of New Super Mario Bros. Wii as well as an installed copy of Donkey Kong, rather than the Japanese bonus of an altered Super Mario Bros.. The decision to install Donkey Kong over Super Mario Bros. is a confusing one: after all, the point of these celebrations is to draw attention to the 25th anniversary of Super Mario Bros., rather than Mario's first appearance. Still, it's a bundled game at the end of the day so it's hard to complain. We don't have an official press release from Nintendo yet, so take this with a tiny pinch of salt for now until it's officially announced. There's currently no word on when this will reach European shores, but expect to see it on shelves just in time for Christmas. We'll keep you up to date with any North American details we hear too. I'll hold out for the Zelda 25th Anniversary Edition. I think I may just have to spring for the money for an extra Wii if that one ever happens, and hope it comes to America. Very nice Wii. Would have liked maybe an extra copy with SMB from the NES as well But, Donkey Kong is good too. Wow that's amazing but I already have a Wii... Then again I could use another upstairs for when one of the family members wants to play the Wii when I want to. All very nice, but they could have at least supplied a red stand to help keep the Wii upright. Looks horrible with the grey! Need to be able to transfer WiiWare/VC games if they expect it to sell. My prayers have been answered! I am definitely getting this for Christmas. Also, don't worry Americans, I'm sure you'll get the Red Wii and All-Stars soon (@GamesX99 To be fair, the EU is usually worse off than NA). The grey stand should of been BLUE, it definitely would of looked more Mario. This is super awesome! I wonder what the North American version will be? The European one seems to have it all: The new Wiimote Plus, New Super Mario Bros. Wii, Donkey Kong AND they threw in Wii Sports. That's one heck of a bundle! In won't be as valuable as the Japanese one, but it's still a very nice bundle! But, my Wii does everything that one does, so there's no point for me to get it. Are you crazy? This will sell like hotcakes, regardless of the ability to transfer WiiWare/VC content. Even so, I think you can get it transferred by sending both consoles to Nintendo. You count on a Gold Zelda Wii whenever Skyward Sword is released in 2011. I have a feeling Nintendo will also release Link's Sword and shield for your Wii Remote and Nunchuck. ^ Yeah, but it would sell even more if Nintendo allowed current owners to keep their purchases. I don't feel like transplanting my old motherboard into a new Wii again just to keep my downloads and online save files. I want one! I hope that NOA releases one for NA! I am more interested in the All-Stars compilation hitting the US than this, but I am happy that you EU get both..lucky! It is weird that Wii Sports Resort isn't included, the Wiimote has motionplus built in, but nothing in the box uses it. PLEASE come to the U.S.A.
As for no SMB. Well is it reuqired, the game is bundled with NSMBW (why not all stars?) and people will probably buy Mario all stars anyway (which has SMB on it). But the Donkey Kong. Does the text say original edition? Whatever could that mean I wonder. I guess it promotes DKC returns. That's nice. I want it. Hopefully for a limited time, they put the edited Mario game on the VC. I already have a Wii so this doesn't really matter to me but the Zelda Wii I would get. But maybe better timing would be a golden triforce 3DS bundled with OOT 3D. Hmm. For a moment I thought it said "Donkey Kong Country Returns"... That'd be a nifty bonus. Pink Wii for Kirby's 20th anniversary in 2012? I plan on getting a new wii soon one for disc games and one for vc and wiiware games.The red is sweet but i perfer the black but i really like the look of that red remote tho. I agree with you it should be. All though Nintendo wouldn't do it, they should but they're thinking how to keep the shareholders happy. Starwolf_UK I do agree with you. As for Europe getting those Wii-snes controllers, yeah it's not fair and I havn't got enough points for them either. I think that the big N should release them World-wide in stores and online to everyone. @XD375: That would be super awesome, but that's not going to happen. I can never warrant selling a console just to get another colour, even if it is the one I wanted ever since the Wii was revealed. ...why couldn't they have released blue?? or something I wasn't so bothered about! Just showed this to my bro since his favorite color is red. He immediately wanted it 'til I told him it was only available in Europe & Japan. I like the black Wii myself and would probably purchase one if it were possible to transfer all my WiiWare/VC purchases.